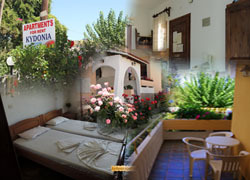 The hotel consists of 2 buildings with an entresol and a first floor, with capacity of 16 rooms - apartments. All rooms include a phone, WI-FI internet, a cooker and a fridge (fully equipped), coffee machine, a TV, air conditioning, hair dryer and a safe box. All the rooms are simply decorated and have large balconies. Rooms are cleaned 6 times a week and towels and sheets are changed twice a week. The reception is open at certain hours from 09:00 to 12:00 in the morning and 18:00 to 21:00 in the evening.